This time of the year winter starts to smell like your brother’s dirty socks. Maybe that’s too extreme a metaphor… but the cold weather and grey skies get a little old. In order to ease the body’s discomfort a trip to the botanical gardens with their warm and bloom filled greenhouses is definitely refreshing! Currently Jardin Botanique in Montreal offers an especially uplifting exhibition that can make you feel spring is right around the next bend. In the northeast the longest season seems to be winter. Spring and summer just fly by, but the cold lingers, and the colors become far too monotone for artists. That’s why it’s great to take a short trip to the greenhouses. The flowers and even the bright green leaves are a feast for the eyes, especially in late winter. Jardin Botanique throws in an even more exciting twist… butterflies of all kinds, and lovely large moths as well. 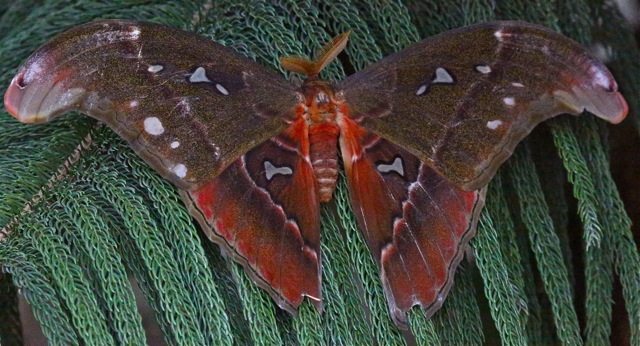 In the largest space in the greenhouses they set free hundreds of butterflies and moths among the flowers and plants. These creatures just go about their business of feasting and mating without regard to the humans in their midst. They fly past your face and land on your back, hang around on flowers and eat fruit and nectar. Every year there are variations of the feeding station seen above. 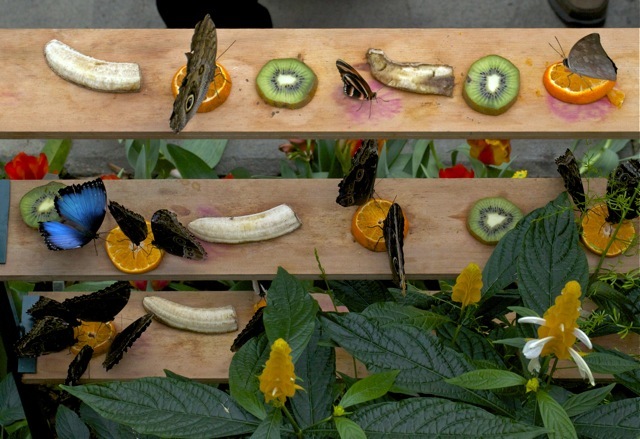 Fruits are placed around the greenhouse for the butterflies and moths to find nourishment as well as varieties of flowers and plants they like. 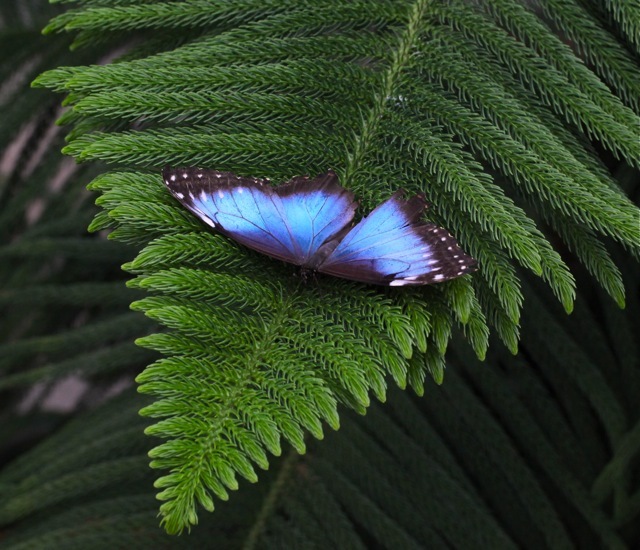 I got a rare photograph of a blue morpho with it’s wings spread. The blue morpho looks completely different with closed wings – the blue is hidden and one sees what look like large eyes on a varied brown field. 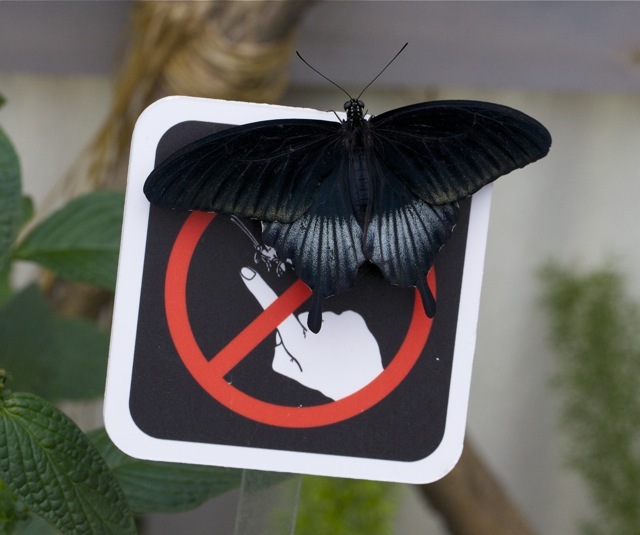 Although the butterflies and moths are free to do as they please everyone viewing them is warned to resist touching – since it can cause serious harm to the flying creatures. Above you see a lovely butterfly perched on a sign. 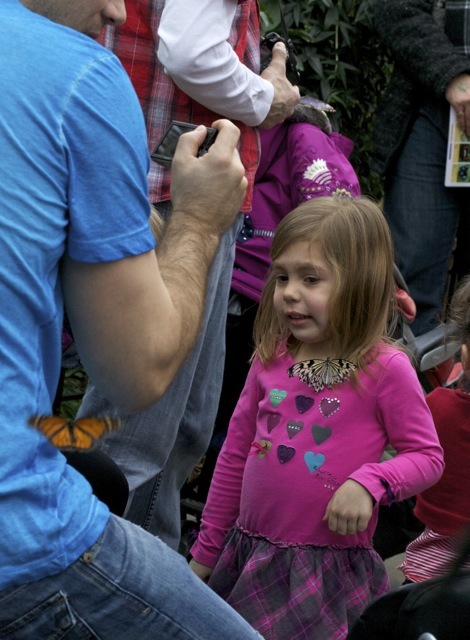 Who knew butterflies could have a sense of humor? Everywhere you look are floating butterflies… it’s a sweet heaven to stand on the balcony surveying the large space and all the flying creatures and bright colors. Food for the soul on these grey winter days. What a wonderful way to spend a winter’s day! I especially like the first shot. Thank you! I enjoyed your blog as well. Not too many butterfly’s around here.